True Neapolitan pizza, fried fish mix called cuoppo and much more – everything in an elegant and welcoming atmosphere! 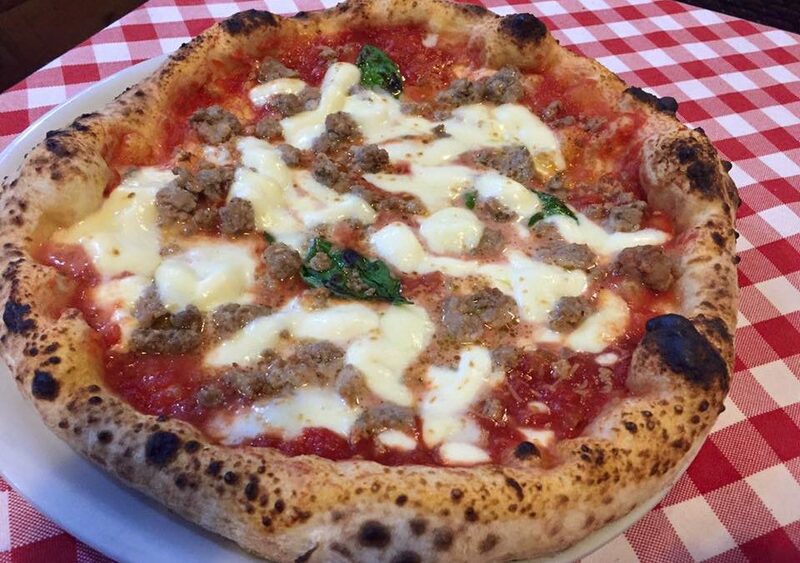 Finally, the true Neapolitan pizza has now an ambassador in Berlin. Water, flour, salt, yeast, tomatoes, mozzarella, oil and basil: you do not need many ingredients to make a great Margherita pizza; however, finding an excellent pizzeria (in Italy as well as abroad) can be hard sometimes. Read the article in Italian here. Malafemmena made it! In fact, Malafemmena is the only pizzeria in Berlin – and one of the two pizzerias in Germany – which has been accepted by the AVPN, that is Associazione Verace Pizza Napoletana, thanks to its high quality ingredients: EVO oil (Extra Virgin Oil), San Marzano, Piennolo del Vesuvio and peeled roman tomatoes (depending on the choice), Le 5 Stagioni flour, cow buffalo mozzarella coming directly from La Sorrentina milk factory and a Valoriani oven, which got an important recognition by Federico II University of Neaples (without this certification you are not allowed to take part in the AVPN). Last but not the least: an incredible team, composed by +39 di Luca Massa, one of the most popular Italian pizzerias which is part of a network including La Solarola academy and five other restaurants. It is not a coincidence that the +39 sign is also included in the Malafemmena designation. Malafemmena +39 pizza. Nine hours fermentation, 1.50/2 centimeter breadcrost, and 450° baking. Sausages and friarelli, Scarola, mortadella and Burrata, Scapece zucchini, mint and mozzarella, 4 stagioni, provola and tomatoes, vegetables, Diavola and so on. Panuozzi, fried Cuoppi and fried stuffed pizzas. he restaurant. The restaurant is also opened at lunchtime. You can taste fish, such as lobster, sea bream, octopus and salmon, as well as meat (marrowbone, “Scottadito” lamb cutlets, and “Ischitana” rabbit). Of course, you can also taste the real Italian pasta, such as maccheroni, and all kinds of homemade cakes. The history of the restaurant. The restaurant first opened in May 2016; the owner, Emmanuele Cirillo (34) was born in Torre Annunziata but then he decided to move to Bologna to study at DAMS. In Rome, he took part in many TV shows, such as Ballando con le stelle and Sky Arte. According to Emmanuele, Rome was too chaotic as a city; consequently, he decided to start a new life in Berlin. Malafemmena is an ambitious local, with a high quality menu, a fantastic dining room and a very large terrace. They have recently opened a catering service for companies and groups of people, too. Not to mention the large amount of events, announced on their Facebook page, which aim to celebrate Neapolitan products and recipes. Thanks to their extremely cheap prices, you can have a soup, a salad and another dish (at your choice) for 7,90 euros. Emmanuele is very satisfied with the local and the great staff, but he is also working to make his restaurant even better.